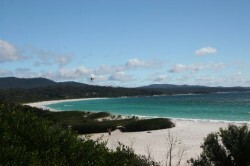 Before we left Freycinet National Park, we visited Friendly Beaches. There is a listed walk there that you can take for from 5 minutes to 5 hours – you can guess which one we chose! Another beautiful beach – what can we say – this is an amazing place. Some creative kids (or old kid), dressed this rock – pretty good. 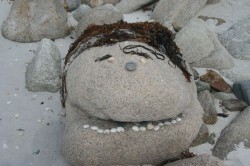 On the 29th March, we headed for St Helens. More winding roads, because there are hills and mountains everywhere. 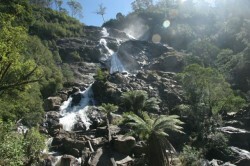 The next day we set off to St Columba Falls, 90 metres high, on the George river. Water flows over at a rate, on average of 42,000 litres per minute, and in winter, up to 200,000 litres per minute. In the 1920s there was a massive flood that changed the falls from a free drop of 90 metres, to the boulder strewn one we see today. 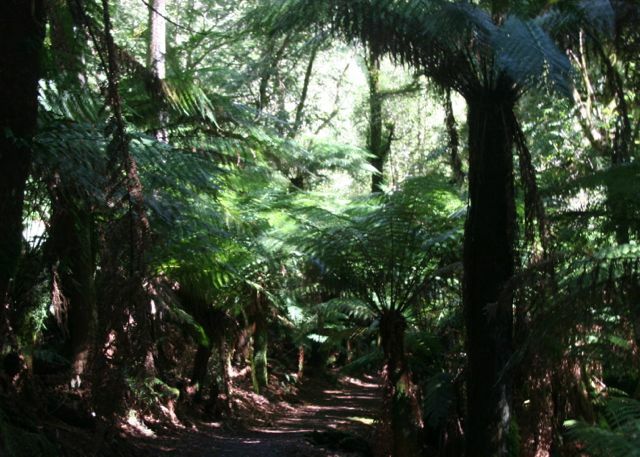 Magnificent walk, although it descends all the way, meaning a climb back, but with the stunning forest and ferns and the breathtaking falls, you can’t complain. We then sampled some local cheese at the Pyengana Cheese Co. and bought some of their prize winning matured cheddar, which had won a National Cheese making award. Definitely worth the medal and we have eaten it for tea over the last two nights. 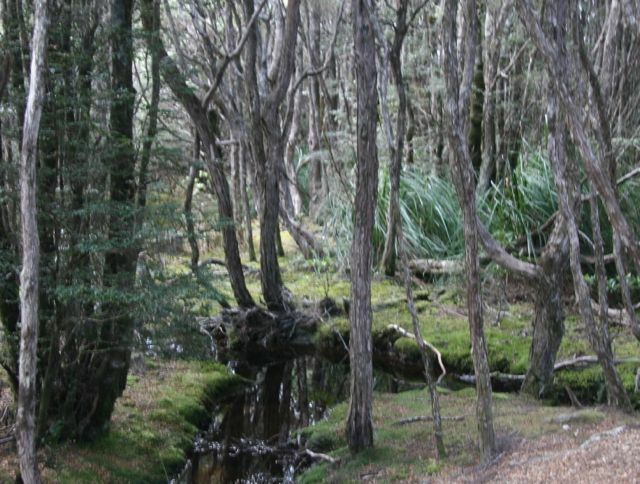 After the cheese factory, we then drove to Blue Tiers Reserve, after trying one road, very narrow and steep, so we turned around, drove to another road closer to St Helens, continued for another several kilometres on a larger, but still steep and winding, road. Blue Tier used to be a tin mining area – now, not a hint of previous habitation – not even weeds, unlike the sides of the roads and the paddocks, off the main roads, which are covered in gorse and blackberries. Russ did a small walk through the regenerating rainforest, regenerating from the ravages of the tin mining. 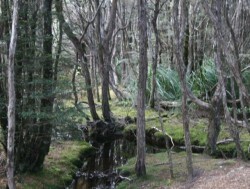 Mosses covered the ground and small streams cut through the bush. 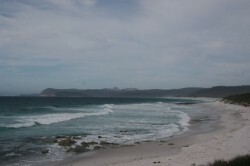 Headed out for a BBQ to the Bay of Fires region, but the wind was extremely strong and was not a good day to be outside. Drove on to Binalong Bay – another stunning beach, bigger than Wineglass Bay, I think and an amazing colour. 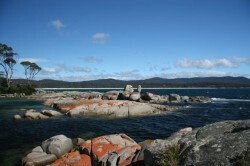 After taking photographs, we decided to come back to the caravan park and cook lunch. We can’t complain about the weather – we’ve been incredibly lucky. St Helens was buzzing today, with every one and their dog out and about. The park is full, with young families and olds everywhere. St Helens is a small town, built on a lovely bay and surrounded by mountains and rivers. Last night it blew a gale and we expected terrible weather today, but the sun was out when we got up and we headed of for a sausage sizzle breakfast provided by the caravan park. It was very well done with heaps of food, an Easter Bunny and an egg hunt for the kids. The good weather continued and we were able to use the gas stove and cook lamb shanks, over a couple of relaxing hours. Yummy.